Our certified technicians will keep your battery in perfect condition. Your vehicle’s battery is one of its most important parts to keep things working. If your battery looses its charge is becomes disconnected, your vehicle will not start, your radio system won’t power on and all forms of lights and climate controls will stop working. It is important to stay up to date on the status of your battery so that you don’t find yourself stranded without a working battery. This is especially important during the cold months, but really is important all year round. For all your battery services, visit Sherwood Park Toyota and our expert Service Technicians will be happy take care of your needs. The life cycle of a car battery ranges from three to five years depending on the grade. The code on the cover of the battery case is its manufactured date, which is important to know so that you don’t accidentally drain your battery. An old battery can affect your vehicle even if it is still working, and driving habits can affect your battery life. In general, short trips (under 20 minutes) and long periods of inactivity will shorten the lifespan of your battery. If your engine is turning on but it doesn’t start or takes longer to start the battery could need replacing. If the vehicle’s lights are dim or not functioning it could be a sign of an issue with the battery. If climate and other functions inside the vehicle are not functioning properly it could be an issue with the battery. If the battery casing is swollen and looks bigger than normal, it is a sign that the battery life is decreasing and needs to be replaced as soon as possible. If the battery has a rotten smell around it, it could have a leak and needs to be replaced. If your battery is more than three years old you should start thinking about replacing it. 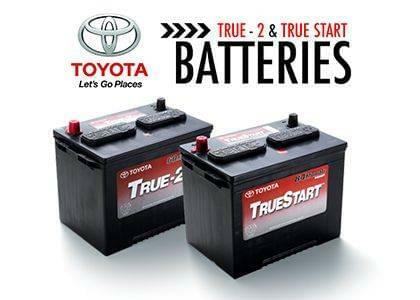 If there are any issues at all with your battery, come down to Sherwood Park Toyota and we will be happy to take care of it. We can perform a full diagnostic and provide you with feedback on its expected lifespan. If your battery needs replacing we can help you choose the best battery for your vehicle. Visit Sherwood Park Toyota at 31 Automall Road, Sherwood Park, AB T8H 0C7 or you can give our expert Service Staff a call at (780) 410-3812 if you have any questions or concerns.